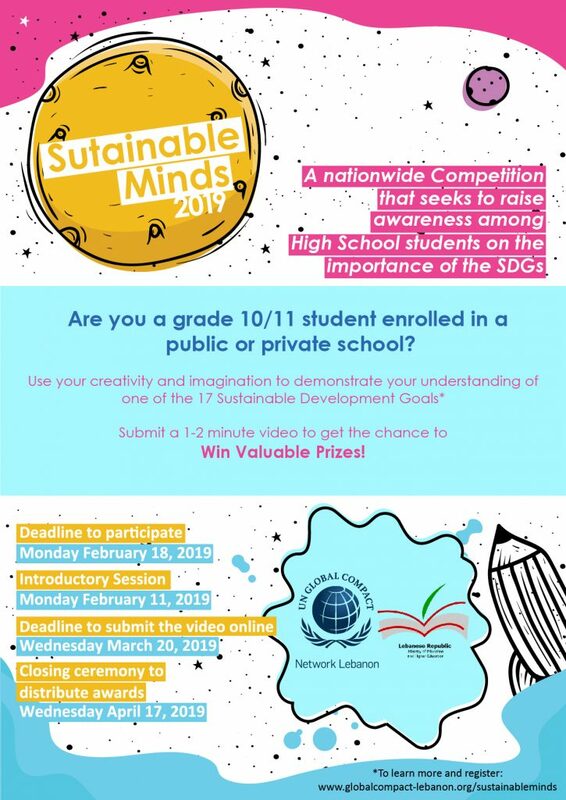 Sustainable Minds is a nation wide competition for high school students to raise awareness about the roles of UN Global Compact Principles and the 17 Sustainable Development Goals.Global Compact Network Lebanon (GCNL), in partnership with the Ministry of Education and Higher Education is organizing its third annual “Sustainable Minds” Competition for grade 10 and 11 students to nurture their understanding of the 17 Sustainable Developmental Goals (SDGs). The Sustainable Development Goals are the blueprint to achieve a better and more sustainable future for all. They address the global challenges we face, including those related to poverty, inequality, climate, environmental degradation, prosperity, and peace and justice. The Goals interconnect and in order to leave no one behind, it is important that we achieve each Goal and target by 2030. Click here to learn more about each issue.